LOS ANGELES–(BUSINESS WIRE)–The Los Angeles County Metropolitan Transportation Authority (Metro) Board of Directors today approved a contract with BYD Motors for the manufacture and delivery of up to 25 new all-electric buses as part of a $30 million clean air bus technology pilot project. This is the first time in Metro’s history that all-electric, zero-emission transit buses will be purchased and placed into revenue service as the agency evaluates electric bus technologies and their applicability to meet L.A.’s rigorous transit needs. Metro’s Advanced Transit Vehicle Consortium (ATVC), a partnership with L.A. City, L.A. County and South Coast Air Quality Management District, will initially purchase five low-floor, 40-foot all-electric buses. After an initial period of testing and evaluation, Metro may then choose to purchase up to 20 additional buses. Metro will also initiate a new solicitation to convert six existing Metro gasoline electric hybrid buses to Super Low Emission Bus standards. The BYD contract contains a local jobs component that stipulates that the firm implement a local jobs program. BYD will comply by performing final assembly of bus components at its new manufacturing facilities in L.A. County. A Lancaster, California plant, which opened in May, is the international firm’s first manufacturing facility in the United States. “Metro already operates the nation’s largest compressed natural gas bus fleet, but this initiative sets Metro on a new course for transitioning to even cleaner electric buses that will be assembled right here in Los Angeles County at the BYD manufacturing plant in Lancaster,” said Michael D. Antonovich, L.A. County Supervisor and Metro Board Chair. In 2011 Los Angeles Mayor Antonio Villaraigosa co-authored a motion with Metro board members and County Supervisors Don Knabe and Antonovich to jump-start Metro’s Super Low/Zero Emission Bus Program to meet future vehicle emission reduction targets set by the California Air Resources Board. The program seeks to test rapidly evolving electric vehicle technologies that have enhanced operating characteristics including extended range, better integrated subsystems and lighter weight construction. Metro will evaluate whether the new all-electric buses can reduce operating and maintenance costs and lower life cycle costs compared with Metro’s current fleet. BYD’s electric buses use the company’s own iron phosphate rechargeable batteries which can reportedly travel 155 miles between charges with a full passenger load. 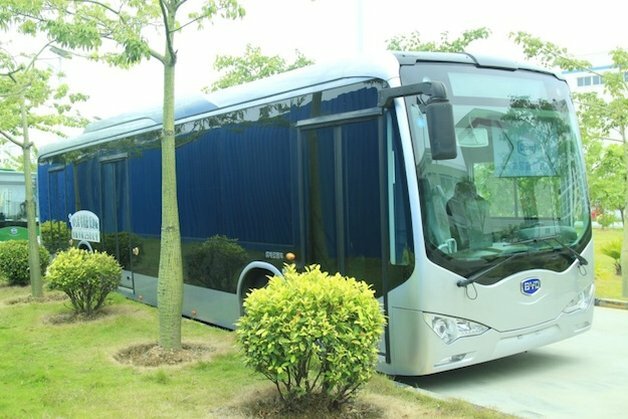 The firm has manufacturered more than 1,000 electric buses in China and was rated highest in the proposal process for technical compliance, project management and past performance. Metro anticipates receiving the new buses early next year. Following an initial evaluation and testing period, Metro plans to initiate new procurements for additional “next generation” zero-emission and super low emission buses based on technology developments anticipated within the next one to three years. “BYD very much admires the forward-thinking vision of Metro and is thrilled about partnering with this great transit agency to deliver truly zero-direct-emissions buses while building up local California jobs to support these buses from our L.A. Headquarters or our bus assembly plant in Lancaster, California,” said Stella Li, BYD Motors President. The program is part of a larger effort to test clean air prototype buses prior to the next Metro replacement bus proceurement in 2016. Funding for the buses has been made available using Measure R funds dedicated for transit operations. Currently, Metro has a fleet of 2,238 clean air compressed natural gas buses operating on 183 bus routes throughout Los Angeles County.